Kids need to learn a great many things before they become independent, autonomous adults, however, parents tend to underestimate just how much their child can do at their age. It’s important that kids eventually learn how to take care of themselves. 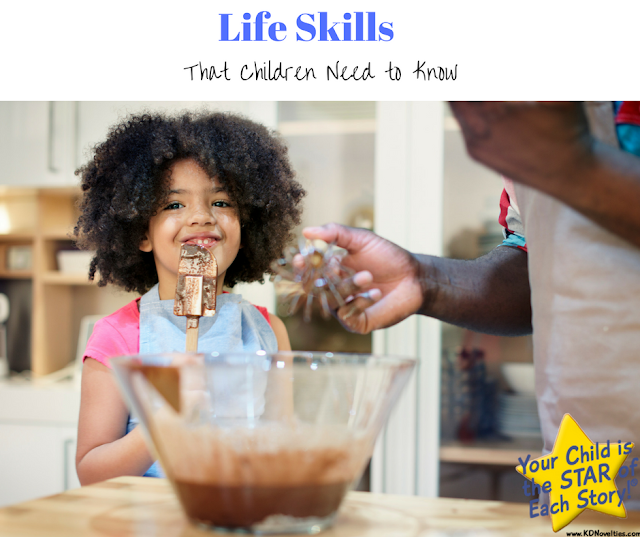 There are several ways in which parents can help instill helpful skills while also allowing their child to learn about responsibility and self-reliance at the same time. Kids are usually the ones waiting around for dinner to be ready, and chances are you’re the one who packs their school lunch every day. It helps to involve kids in cooking for a variety of reasons, including introducing kids to different, unfamiliar foods and encouraging them to eat healthier, too – but have you thought of letting your kids cook, for a change? Kids shouldn’t be using kitchen tools they’re not old enough or experienced enough to use yet, but it can be extremely valuable to teach your child how to make a simple meal for themselves, or even a few. Cooking and preparing food is a life essential skill to have. Teaching your child how they can feed themselves not only helps them feel more grown up, but it can help in an emergency. If you’re sick, or unable to make food, or even if you are simply busy, knowing that your child has knowledge of simple food prep can go a long way. You can teach kids age appropriate meals as they get older, and who knows, you may even inspire a young chef! It’s surprising just how many kids in high school, or even college, do not know how to wash and care for their clothing. 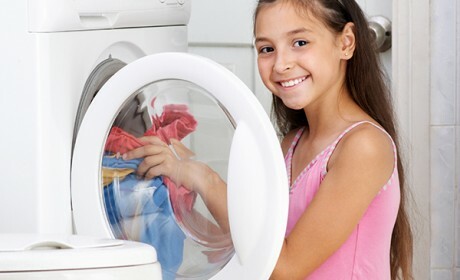 Doing the laundry can help teach kids how to be responsible for their own things, how to care for different fabrics (which can be applied to a variety of other domestic situations as well), plus it can help take a load off your back, too! If your child knows how to do their own laundry, you can include it in their weekly list of chores or rotate responsibilities when needed. Many parents give their kids some kind of allowance. Giving children money for completing chores or doing well in school is one thing, but it also helps to teach them smart habits about spending (and saving!) that money as well. Teach kids about comparison shopping and looking for good or better deals, teach them about couponing and research, and give them a few tips about creating a budget, too – especially if they’re looking to save up for something special but find themselves tempted by wanting to buy other things in the interim. These are great skills for children to have before they get jobs or go live off on their own, like college living or their first apartment. Writing letters may seem antiquated now, but it’s important for them to know how to construct a proper letter of acknowledgement, like a thank you letter for a gift from a relative. Writing can help to teach a child to properly conduct their thoughts and ideas into a formal letter. Children will certainly need to compose essays for school and college acceptance, and or need to write cover letters for jobs when they are older; therefore letter-writing skills are definitely handier than most people think. It’s especially important that kids are aware of what to do in an emergency. You never know when they will be in a situation where they cannot get to you, are alone, or you are incapacitated. Make sure that your child knows your basic information and whom they can trust to tell it to. Teach them about calling for help and how to articulate themselves as well as the potential situations they may need help for. It’s also vital that families discuss emergency protocols such as what to do in the event of a fire or any other kind of disaster. This may be a difficult subject to discuss with your children, and parents may be afraid of scaring their kids, but these are important things to talk over and make sure they understand thoroughly, for their own sake as well as your own. KD Novelties is a publisher of personalized children’s books and provides reading tips and resources for parents.